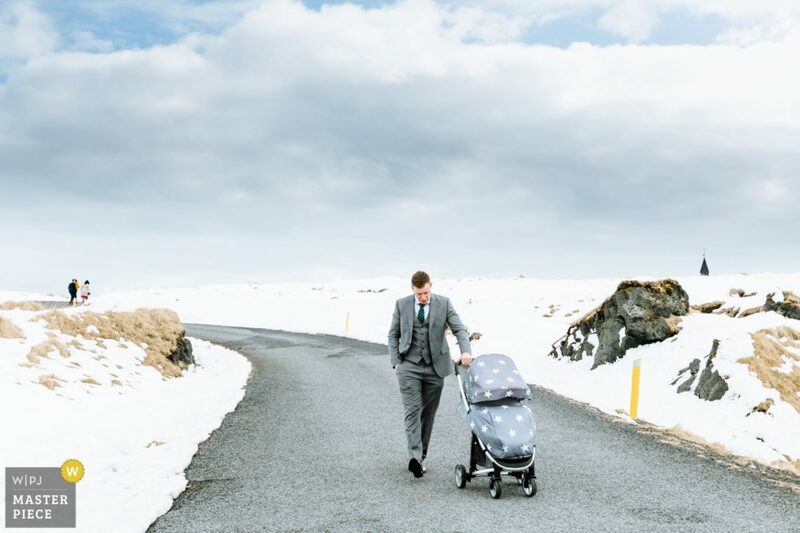 This week I was delighted to wake up to the news that I was a WPJA Gold Masterpiece Award Winner for this photo of a young dad trying to get his child off to sleep, in the middle of Iceland. The WPJA Gold Masterpiece Award is an internationally recognised award judged by a panel of highly acclaimed photojournalists and picture editors from around the world–and not just in the wedding industry, but throughout the entire photographic industry. So to receive an award winning commendation from them is hugely gratifying to say the least and a real filip at the end of a brilliant but exhausting wedding season. This looks like a fairly relaxed, straightforward shot, and it was, once I’d got there. But I remember seeing this scene off in the distance as I was heading to the ceremony. In fact, I was probably further up than the small trio of people turning the bend off in the distance. So I had to run back down that pretty icy path in wedding shoes and then ease up and casually saunter past the dad when I got there as quietly as possible. Then pretend to be taking a photo of something else before getting this shot as unobtrusively as possible so I didn’t influence the scene in any way. Luckily the dad was too focused on getting his child to fall asleep to pay any attention to me. I shot of him looking up would have been okay, but I much prefer the fact that he’s in his own private space in this photo. I also like the fact that the wedding guests on the left of the image are balanced by the tip of the Black Church of Budir on the other side of the frame. I’ve also just realised that I haven’t blogged this Iceland wedding itself, yet. I will go and do that now…..